Littelfuse LSP10 Surge Protection Modules provide transient overvoltage protection for outdoor and commercial LED lighting fixtures. Constructed with Littelfuse thermally protected Varistors, they provide robust surge current handling capability. A built-in thermal disconnect function provides additional protection from catastrophic failures and fire hazards, even under the extreme circumstances of Varistor end of life or sustained overvoltage conditions. The LSP10 is available with either parallel or series connections. 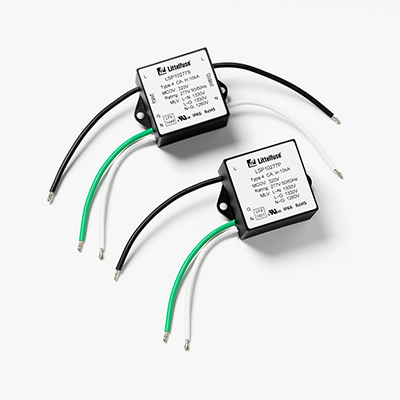 With the parallel-connected version, an indicator wire can activate an LED to tell maintenance personnel when to replace the SPD in order to ensure the luminaire remains protected. The series-connected version cuts luminaire power off to provide a clearly visible indication the SPD should be replaced.